Do you want a Mesa Home Inspector that works for you? Do you want an honest, objective, impartial Mesa Home Inspection performed on your home? If you do, please consider Quantum Home Inspections, LLC for your inspection needs. Welcome to the website for Quantum Home Inspections. My name is Jeff Moore and I am the owner/inspector for the company. Take a look around the website and consider if I meet your needs for a Mesa home inspector. Even though I am in Mesa, I travel to all parts of the valley without an additional fee. I have posted my fees', using the link to the left side, because I want you to know in advance that I am not the cheapest nor the most expensive Mesa Home Inspector in the valley. I will provide you with a honest, objective look of your potential new home as it was on the day of inspection. And yes, I perform every Home Inspection as if it were for my Mother. You, my client, are someones brother, sister, son, daughter, mother or father and this home purchase is important to you and your family. I will, to the best of my ability, perform your inspection and provide to you a report of the homes condition. The home inspection report provides an insight to the condition of the major components on the day of the inspection. From the first contact with me through your Home Inspection, delivery, and explanation of your report, you will experience the ultimate in professionalism. There are many home inspectors available in Arizona for you to choose from for your home inspection and I want to be your choice. Quantum Home Inspections, LLC , the one you would choose for your Mother. Please follow the links to view pictures from previous inspections or to review a Sample Report. 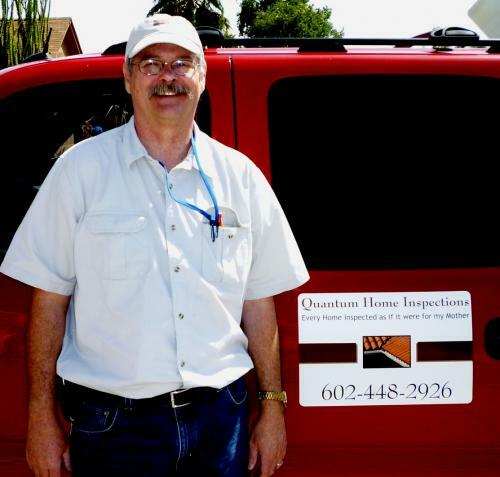 Quantum Home Inspections, LLC is a top home inspector in the Mesa, Arizona Home Inspections guide on Inspectopia.com.